Yoozon Party Lights, [2-PACK] Sound Activated Disco Ball Party Light, 7 Lighting Color Disco Lights with Remote Control for Bar Club Party DJ Karaoke Wedding Show and Outdoor(3W) (Black) by yoozon at Right Clearing. MPN: YZ-Disco Balls-Black(US). Hurry! Limited time offer. Offer valid only while supplies last. ★★3 SOUND ACTIVATED MODES: With 3 sound activated modes, light off, dynamic and strobe effects to meet your needs for the different atmosphere of one party. 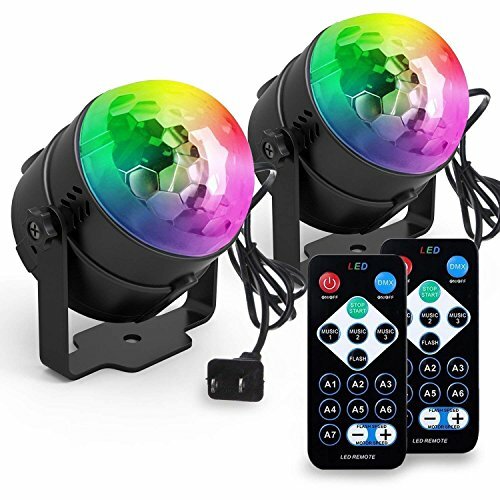 ★★WHAT YOU GET: 2 x Disco Balls Lights, 2 x Remotes, 2 x Installation manual; Changing both of the lights with one remote. Lifetime Warranty for refund or replacement. If the item you have received is defective in any way, please feel free to contact us for replacement or refund.